Short hikes with a big payoff! 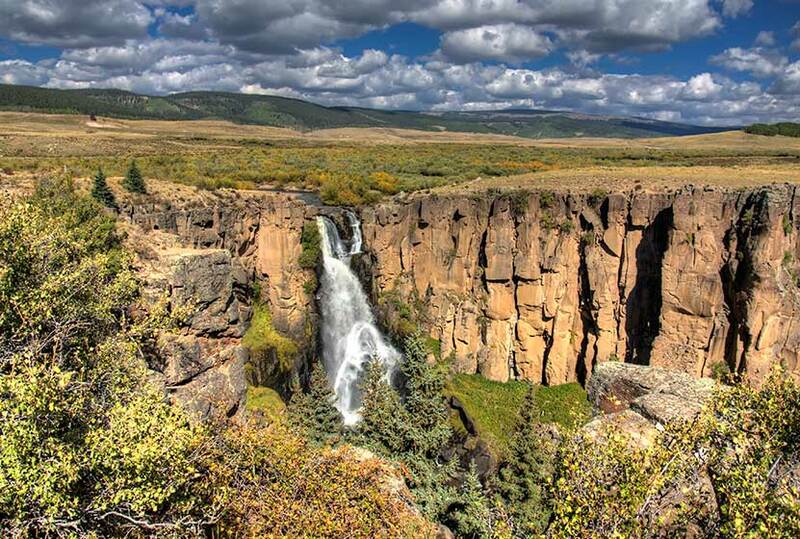 Ten Colorado waterfall hikes, one mile or less! 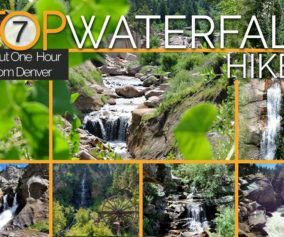 Most waterfalls in Colorado require demanding hikes through difficult terrain. But not everyone has the time or ability to hike deep into the Colorado wilderness to discover these gems. 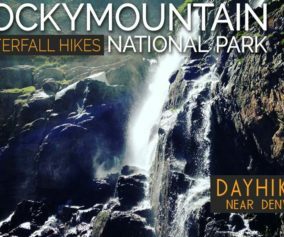 That’s why we’ve compiled this set of 10 easy-access waterfalls, most requiring less than a 1-mile round trip hike. A few of these hikes can be enjoyed from the car or handicap accessible viewing areas. These short waterfall hikes can be found in different parts of the state, making the scenic drives to these waterfalls half of the adventure. 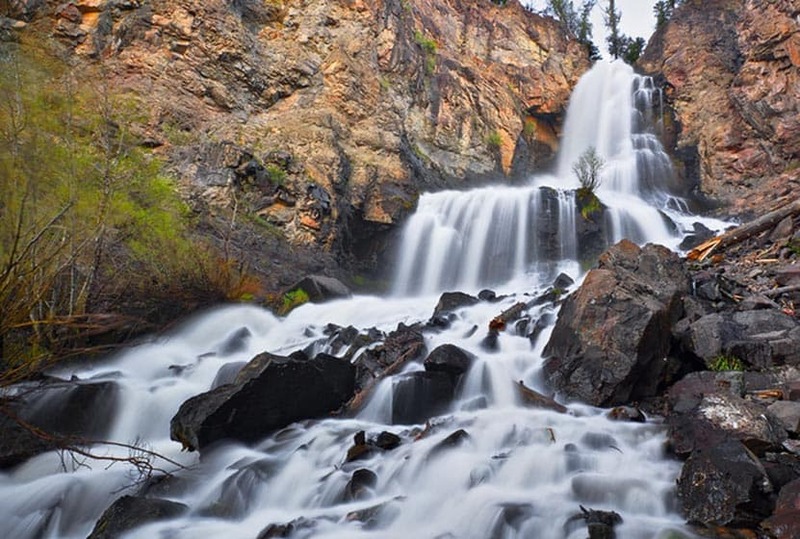 Explore the full set below and build your Colorado Waterfall bucket list. 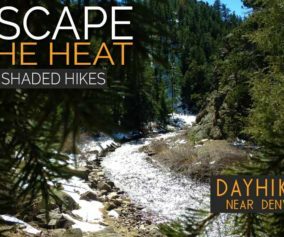 Be sure to download our Free Hiking Guide to help you prepare and pack smart for your dayhikes near Denver. Rifle Falls launches off a limestone face 70 feet into a segmented, triple waterfall. The lush surroundings and shaded picnic area are also the home to a series of caves just waiting to be explored. 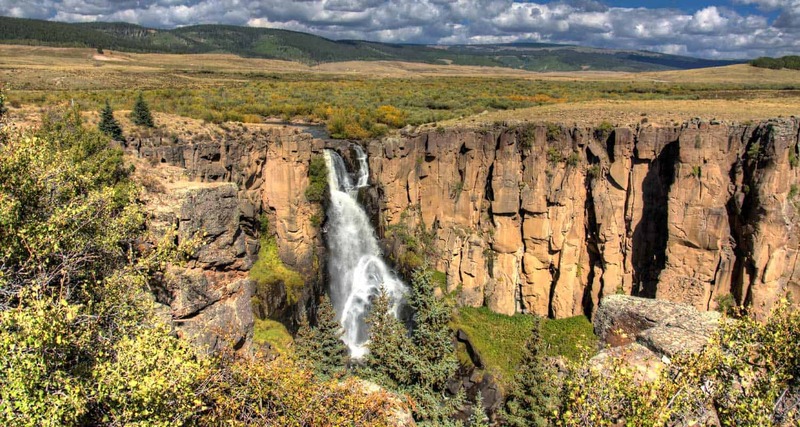 So, bring your flashlight or headlamp if you plan to visit Rifle Falls State Park. Explore the full trail profile to get the trail map, driving directions, and more for Rifle Falls. 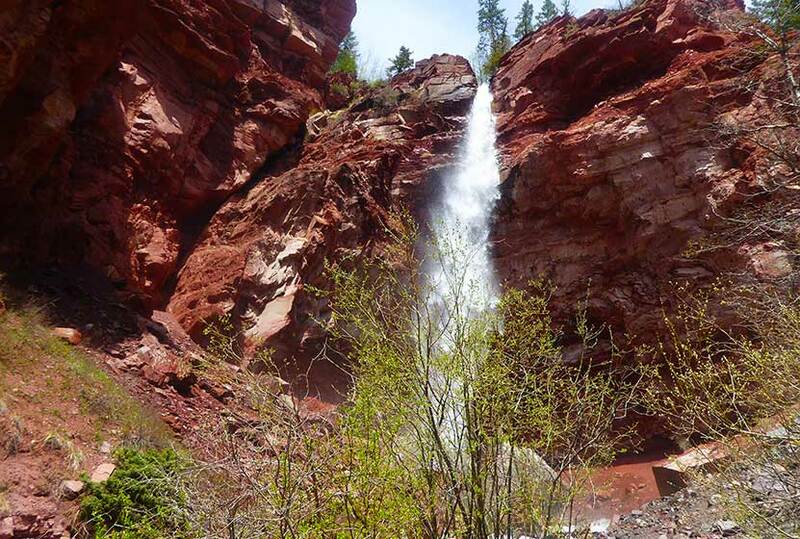 It’s just a 1/4 mile hike from downtown Telluride to Cornet Falls, an 80 foot waterfall pouring over the red cliffs above. On the trek back down, hikers will enjoy views down into this quintessential, Colorado mountain town. Read the full trail profile for parking details and more. You’ll find Adams Falls on the border of Rocky Mountain National Park near Grand Lake, Colorado. 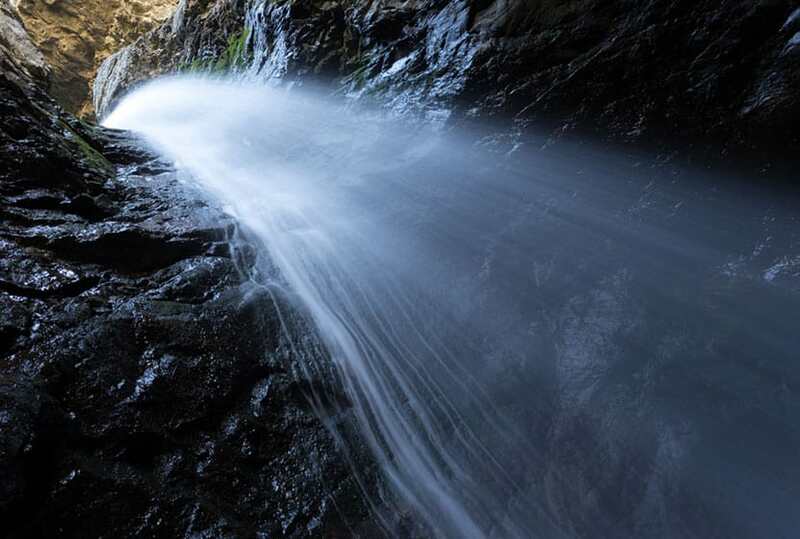 Explore this easy hike to gain views of this race waterfall. 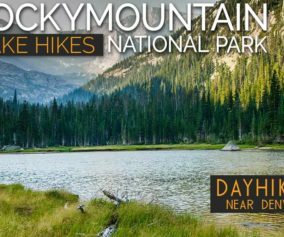 Hike a bit further down the trail to take in the expansive landscape of the east meadows in Rocky Mountain National Park. 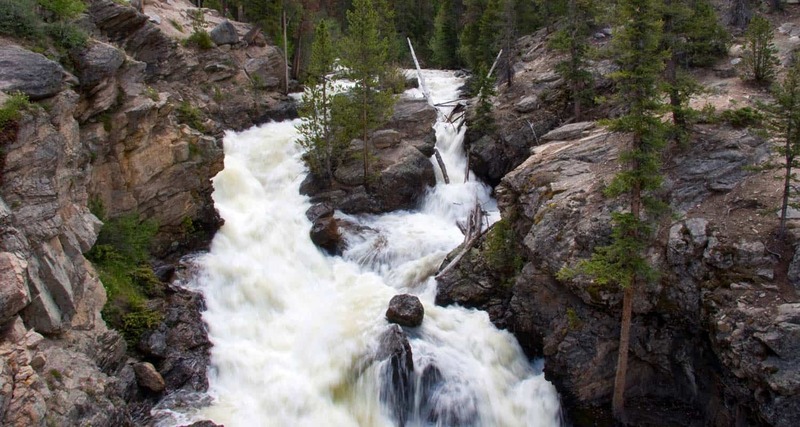 Fish Creek Falls drops nearly 300′ feet, making it one of Colorado’s highest waterfalls. This short hike near Steamboat, Colorado, has two observation areas and is the trailhead for more challenging hikes. It’s a must see if you are planning to vacation in this beautiful part of Colorado. 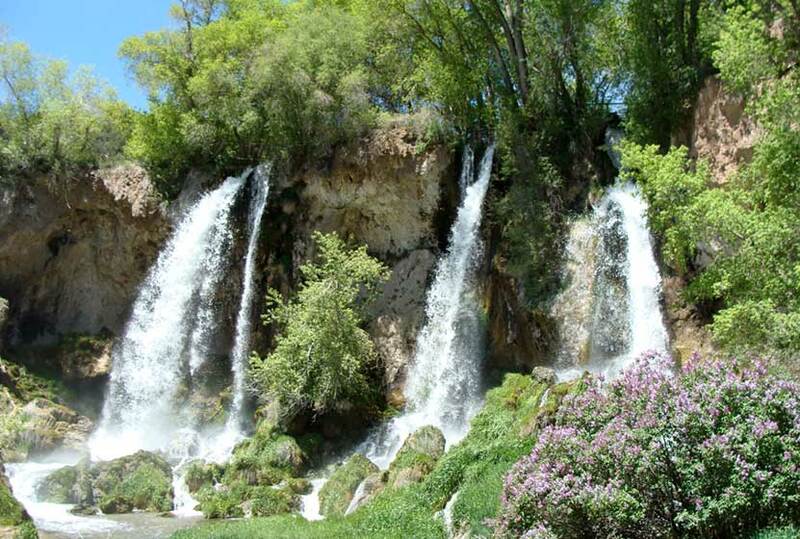 Zapata Falls is one of the more unusual waterfalls in Colorado. To access it requires a short hike, wading across Zapata Creek, then exploring the rock chamber where the waterfall pours down from the heights above. The hike to Zapata falls is a great option if you are visiting or camping in the Great Sand Dunes National Park. See the trail profile for camping info, driving directions, and more. 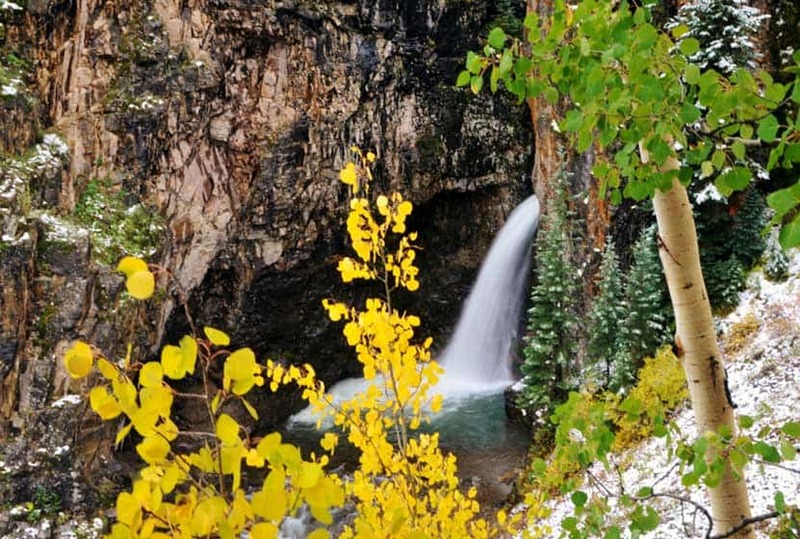 Legend has it that back in the 1700’s, French Trappers buried a cache of gold in this area of Colorado near Treasure Falls. A popular vacation stop, Treasure Falls offers a great 1/2 hike to the 100+ foot falls. There are two observation decks and interpretive signs explaining the history of the region and the legend of the treasure. 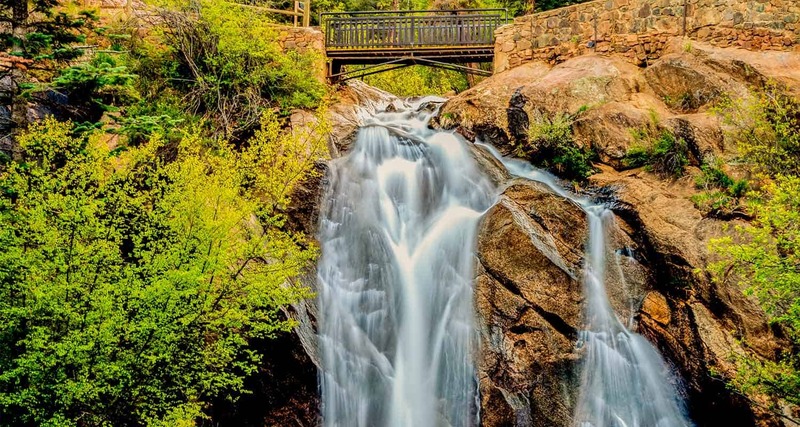 Helen Hunt Falls is accessed via a beautiful drive into Cheyenne Canyon in Colorado Springs, Colorado. Two more waterfalls beckon hikers to explore the trails beyond the falls. Read the full trail profile for parking options and a longer hike approach from the entrance of Cheyenne Canyon. 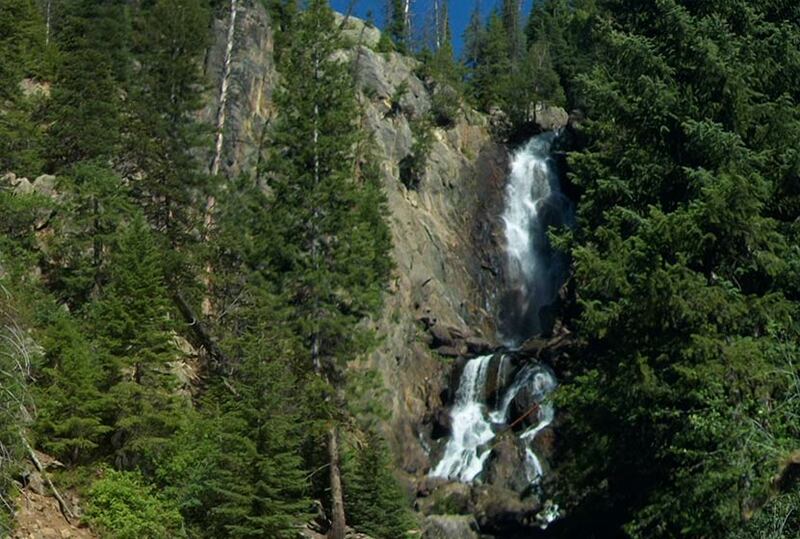 Whitmore Falls is off the beaten path about 45 minutes outside of Lake City, Colorado. This plunge waterfall pours into a mesmerizing, emerald green pool. Be sure to pay careful attention to the driving directions to this waterfall along Engineer Pass road. See the full trail profile for the details. It’s just 1/8th of a mile hike to soak in the beauty of Silver Falls as it tumbles over the pink and orange cliffs that surround it. Silver Falls is about a 40 minute drive outside of Pagosa Springs, Colorado, a beautiful drive along the course of the San Juan River. 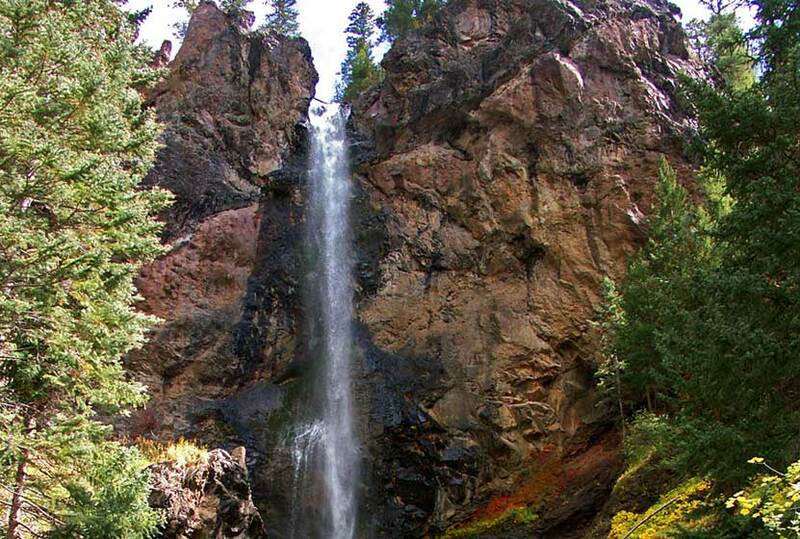 North Clear Creek Falls in Southwestern Colorado is a 100+ foot waterfall accessible from a well maintained pull-off. It’s a great roadtrip stop, a place to stretch your legs and to enjoy a picnic lunch near the sight and sounds of the falls. Read the full trail profile for driving directions and more. Ron, thanks for the recommendation. We’ve left Hanging Lake out of this particular post because the round trip distance is 2.4 miles and because it’s a bit more demanding because of the elevation gain. However, it’s great. For those interested, check out our Ultimate Guide to Hiking Hanging Lake. Nicely done! Looks like we need to plan a trip!!!! There’s two nice one you missed. Both in RMNP. Both less than a mile. Alberta Falls, short hike, minimal elevation, just at a mile, easy trail. Also, drive up OLD FALL RIVER ROAD, only open JUL/AUG, sometimes JUN, if the snow has been light in winter. There’s a pullout with parking for about 10-12 cars, so get there early. CHASM FALLS, less than a mile but downhill, with steps all the way and paved trail. SEE my Colorado galleries/website for photos, http://www.pbase.com/issyr. I’m a diabetic with short hikes only capability. I’m always looking for short scenic hikes!